One of my favorite pastimes is watching films and I often watch some over and over again. A great treat for me is when I come across a film that is older, and yet the film is new to me. I love being transported to another time and place. Recently, I was given the opportunity to see acclaimed director Robert Altman's 1969 psychological gothic thriller, That Cold Day In The Park. Eureka Entertainment is releasing the film for the first time ever in the UK in a dual format edition as part of the Masters of Cinema Series on June 20th, 2016. This intriguing film was directed by Altman just prior to his career breakthrough with M*A*S*H.
That Cold Day In The Park tells the story of Frances Austen, a young, wealthy spinster, who invites a mute teenager into her apartment after finding him freezing in the park next to where she lives. France's talkativeness meets the young man's silence and highlights her sense of loneliness. She has friends, but they are older and you can feel the disconnect between herself and them. She socializes with them but to me she seemed to be on the periphery of their get-togethers. Frances welcomes him into her home and becomes increasingly possessive towards him and things go into disturbing new realms. This film is an intriguing look into human emotion and desperation. It's an interesting example of Altman's early work. I really enjoyed this film. 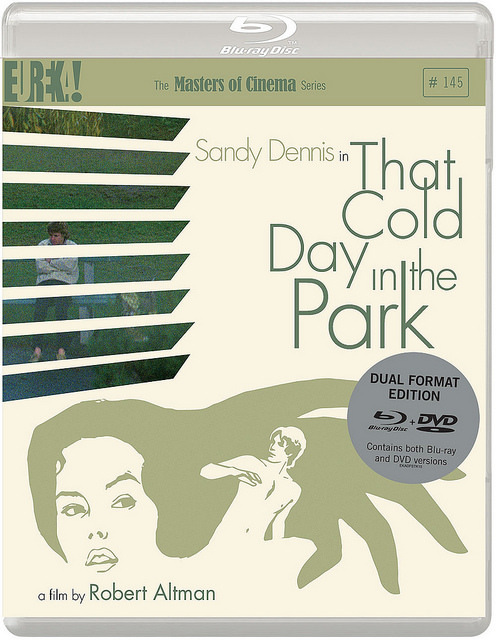 That Cold Day In The Park is available to order from Amazon here .